While immersed in Darrel J. McLeod’s Governor General’s prize-nominated memoir Mamaskatch, I found myself flipping frequently to a picture on the front cover. The adorable Cree boy in the photo, probably about eight or nine years old, had already experienced extreme racism, violence, and trauma when the image was taken. He’d been expected to care for younger siblings and for his destructive, unstable mother. He’d been left to fend for himself, and not been given the tools to do so. Yet his eyes sparkle with curiosity and joy. His cheerful smile suggests friendliness, openness, eagerness to learn and make friends. Then I’d flip to the inside back cover, to a current photo of the author. He’s wearing a traditional Cree vest of beaded leather, and has the look of a peaceful warrior. 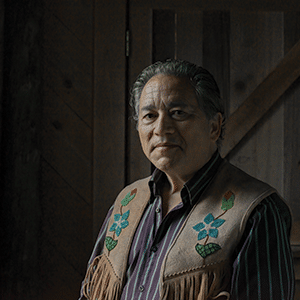 He’s a man who holds multiple degrees, is a chief negotiator for lands claims for the federal government, a medical professional, an accomplished musician and a writer whose first book is making waves on the Canadian literary scene. The title, Mamaskatch, takes its name from the Cree word which is used as a response to dreams shared. It is the telling of McLeod’s turbulent young life, from a child living in the woods of Northern Alberta, to a teenager in the Rocky Mountains of Canmore, to sexual awakening, confusion and abuse in Calgary, and eventually to Vancouver. From early childhood, McLeod longs for a “normal” life, and delights in music, math, reading, being outdoors, acting, and spending time with the relatives he adores. But happiness eludes him. There is violence at home, alcoholism in his family, racism at school, turmoil as he struggles with his sexuality, and desperation as he witnesses the destructive paths some of his loved ones take, and craves the traditions and lifestyle of his ancestors. While the characters and the tales in each chapter are fascinating, it is McLeod’s honesty and vulnerability that make this book so powerful. In places Mamaskatch is so blunt and brutal it will make you squirm. However, while it is at times difficult to read, it is also impossible to put down. Scenes of McLeod’s mother Bertha’s experience at a residential home (and her escape) are as vivid as they are horrible. When the narrative shifts into Bertha’s voice, the intensity is increased even further. We also witness McLeod’s brother’s difficult transition from male to female, and the trauma that she endured in the process. The book is peppered with images from Cree tradition and from nature: birds as messengers, the splashing river waters, and the comfort of the mountains. There are elements of the non-linear narrative common to oral story-tellers in indigenous cultures. It is also a spiritual journey, dipping into fundamentalist Christianity, a rejection of Catholic values, (with a quick exorcism along the way) and a reconnection to Native traditions, ancestors and beliefs.